I am so thrilled to finally reveal a project we've been working on at Silhouette School headquarters for months!!! Together with Wayfair as our sponsor, we have transformed our dark red dining room into a light and bright home office that I consider industrial-masculine-chic. Many of you know that a few months back my husband, Bob left his job in Corporate America to join me full time on the blog (read about our journey blogging full time as a couple on our other site Boss Lady and Bob). In less than three years, Silhouette School has grown from a blog into a full fledged business with a whole series of books, a membership site in the works, speaking engagements, and more - and so we decided going into business together would be best for our family. What is not best for our family or relationship or business...is sharing an office. When it comes to working - I need my own space. In other words: Bob needed his own office. 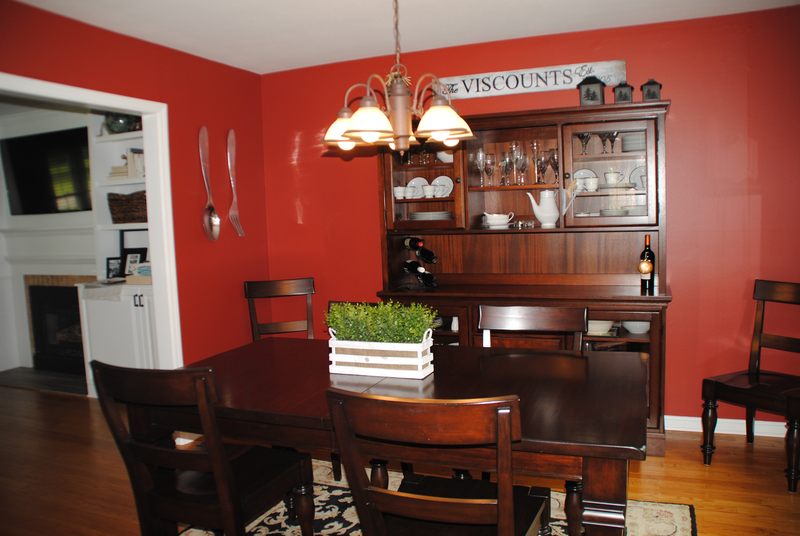 It was pretty evident that our barely-used red dining room was on the chopping block. I have to admit, I did not shed a tear to see it go...so take a good ol' look at the 'before' because the difference is pretty shocking! 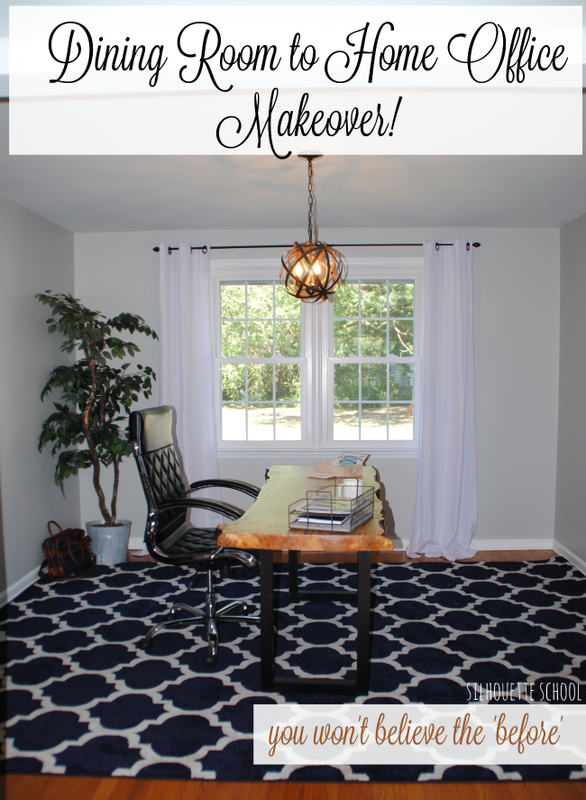 In fact I am thrilled with how the dark dining room to gray home office makeover turned out! We've been working for months behind the scenes to get this space perfect (and there were even a few Silhouette projects along the way...see if you can spot them) - as there's a fine line when you have a home office space right smack in the middle of your main living area! Keep in mind this room is connected to both the kitchen and the living room so closing an office door to hide any type of mess is not possible! The center piece of Bob's gray and navy home office is the live edge desk that I had built for him as an anniversary gift by a local husband and wife team (also Silhouette users!) You can find a similar tree slab desk here. 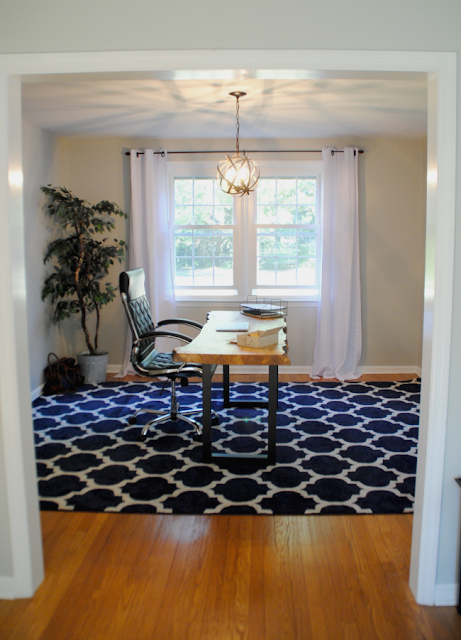 There's no way this room makeover would have been any bit as amazing without our friends over at Wayfair who soooo graciously agreed to team up with us for the rest of the office furniture and decor. I am just thrilled with how it call came together...especially on a rather tight budget! Since we painted the walls a light gray I knew I wanted something darker on the floor and this Wayfair 9x12 navy area rug is perfect. It's so soft and just really gives the room a rich feel, comfy feel. It's masculine enough for Bob, but yet blends with the style of the rest of the house. While I have claimed this spot as my own, Bob claims the Wayfair high back office chair is the most comfortable desk chair he's ever had. I can tell you it's definitely the most stylish! I love the leather-look and chrome with all the wood in this room. ...and replace it with this Wayfair 3 light globe pendant orb light. I love everything about it! And can we talk about the amazing shelf? First of all I love the rustic feel of the wood and the black metal on the Wayfair Industrial Open Shelf. The best part, though, is it's large enough (81" tall and almost 16" deep) to actually hold a good amount of stuff. And I'm not just talking about stuff stuff...Bob needed a place to put a printer - and the bottom shelf is plenty wide enough to accommodate his large printer. Of course I also wanted to decorate with some accents - because, again the office is in the middle of the living area. Since monograms are my thing, that big old vintage 'V' Wayfair metal letter block was calling my name! And finally, the window treatments...I mean what a difference from what was above those windows when this room was being used as a dining room. 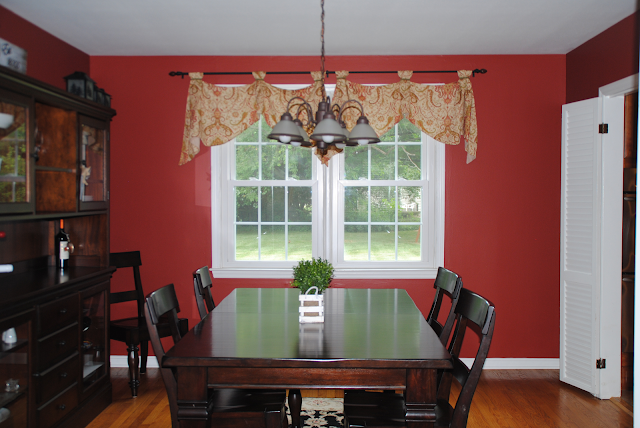 Hanging these Wayfair white grommet panels rather than the valences just make those windows look so much bigger! I don't think I could love how this dining room to home office came out any more. 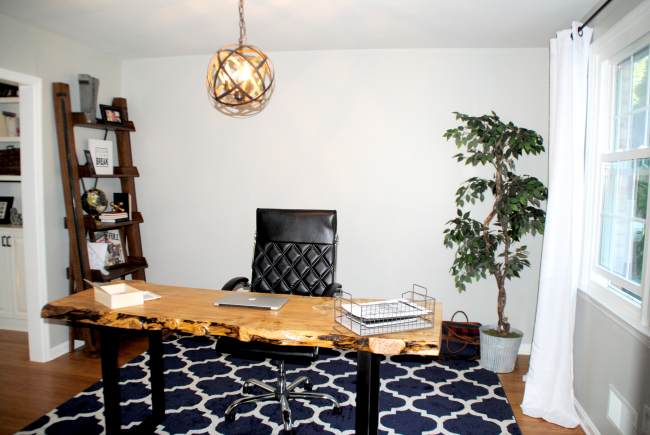 A special thanks to Wayfair for helping us turn this dark dining room into a beautiful, comfortable and stylish home office! I guess he doesn't do crafts..... haha (joking) any craft room would be way more cluttered. You are correct in your assumption! lol He's more of a numbers and marketing kinda guy. The room is beautiful but it reminds me of your backdrop you use. Bob's office picture has no cords, no phone, no pencils, pens, tablets etc etc etc!! I don't run a business yet my desk sure doesn't look like that! I have that same ugly chandelier. It came with the house. You've inspired me to toss it. Hi question do you have all your books in Spanish? I have my cameo and I could do much with it because I need instructions! I just bought the same light Melissa for our entryway! :) Super cool new office! Looks great! Awesome makeover. It looks great. Thanks for sharing. Dining rooms don't serve much purpose the way most people live today. I'd love to do something like this with mine. I wonder if it will stay so neat though. I can't imagine a working office without some closed storage and drawers. My wife and I want to start our own blog about fostering. What hosting service do you use? can I ask how hard was it to cover the walls? did you prime? how many coats and what is the pain called? I see walls begging for a silhouette made decorative element! Absolutely love the the changes! Very masculine looking office space! Love your blog and inspiring ideas! Room is very nice. Thank you for all you do for us! I love the difference....I fought to change rooms around. I am still working on it. Our dining room became a den. Our living room became a dining room to house our family for big meals. I would love to move the dining room into the Family Room (adjacent to the Kitchen), but the hubs is holding his ground because that is where the fireplace is. I would love to make what is currently our dinging room into a Family room. 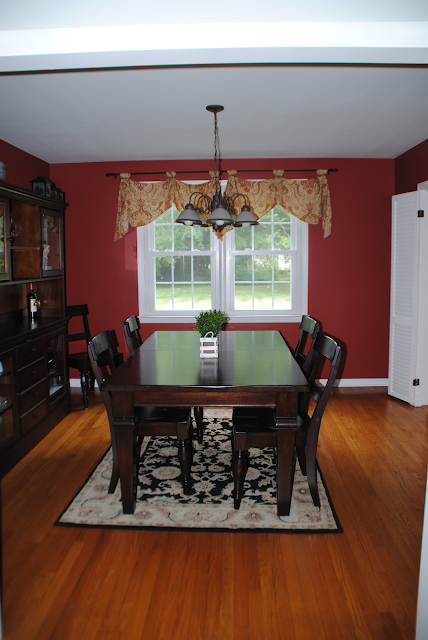 My old old dining room is small and is a darker red than yours with the white trim around windows and doors and all from the chair rail to the floor. I bet this sounds confusing. If I still have your attention (LOL!) I would love to make the den into my studio/office. I often have need for an extra bedroom and this would fix everything. We have a Man Cave/Storage basement. This makeover is AMAZING! Great job!! Really nice makeover! You've inspired me to get started on my own. great job.